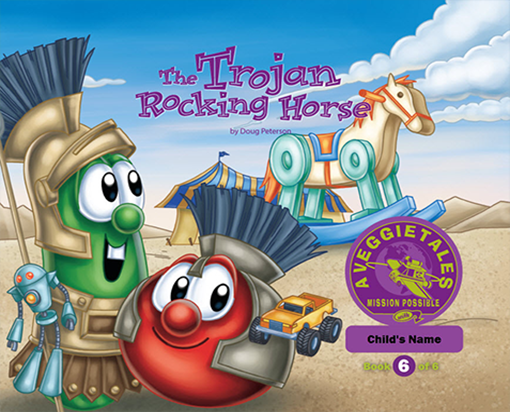 Let the special child in your life be the star in this exciting Personalized VeggieTales® Mission Possible book series with Bob the Tomato and Larry the Cucumber! Your child is the hero in every book! Search for your child's name and let the adventure begin! 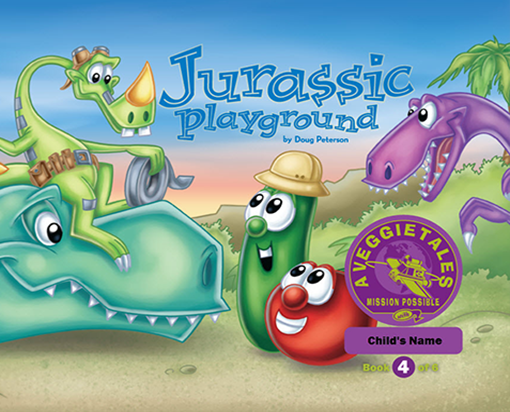 Let the special child in your life be the star in this exciting VeggieTales@ Mission Possible series with Bob the Tomato and Larry the Cucumber! Every child wants to be the star in their own adventure! 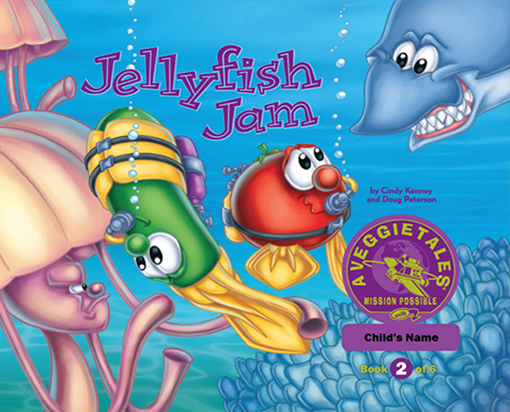 In this new, VeggieTales® Mission Possible series, kids get to be the star in every book! In this first exciting story, your child will jump on board the "Get Up'n Go Machine" and learn the importance of caring about others. 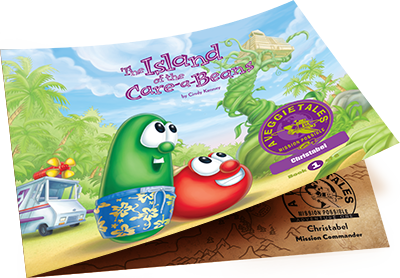 The Island of the Care-a-Beans is in danger of sinking into the ocean! Bob the Tomato is worried silly. Larry the Cucumber is looking for a superhero. But all this adventure really needs is that special child in your life! 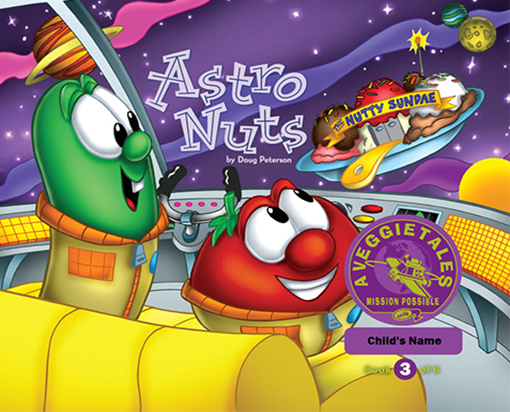 Blast off with Bob and Larry as they head to the Nutty Sundae Deep Space Ice Cream Shop. But beware! Our heroes are not just in the search of a triple scoop sundae with caramel sauce and a cherry on top. They have been given a very serious assignment by Mission Control: to save all the ice cream in the universe! Greedy robots have taken over the ice cream shop and are refusing to share the ice-creamy goodness. It's a Mission Possible Adventure of the most delicious kind! Through it all, there's a lesson to be learned: When you keep everything to yourself it doesn't make you happy. Only when you share do you have true happiness! The "Get Up'n Go Machine" has taken a wacky turn to the frozen tundra and you won't believe the wonders that await! 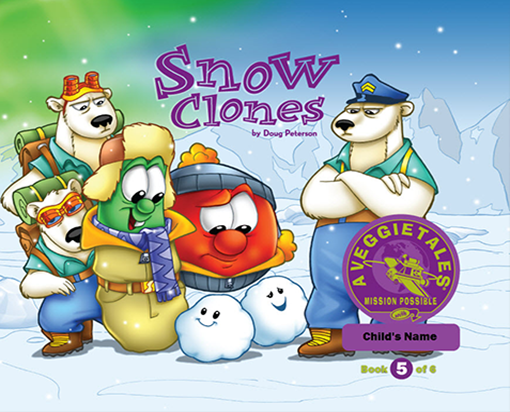 Polar Bear Troops and a true navy seal are among the surprises that are revealed at each turn in this icy maze. Once again, our heroes have been given a very serious assignment by Mission Control: to teach these polar bears to be warm and caring even to their strange neighbors. Through it all, there's a lesson to be learned; no matter how strange or different someone may seem, we should always treat others as we want to be treated. You'll never believe where our heroes have landed now! A giant toy store on an ancient Greek Island! This could be their most incredible journey yet, filled with kings and queens and a giant rocking horse. (oh my!) The King and Queen of rival countries learn some valuable lessons from our heroes in this final installment of the the Mission Possible series. Once again, our heroes have been given a very serious assignment by Mission Control: to teach the king that true happiness means being content with what he has. 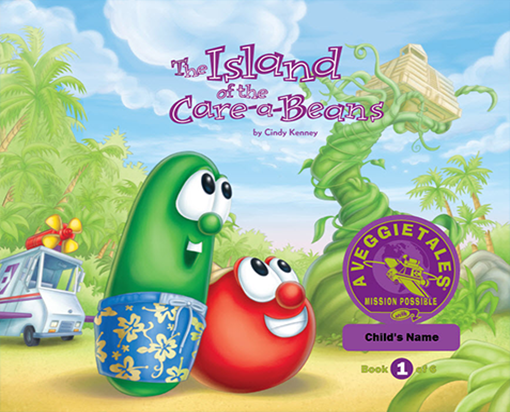 ©2015 Big Idea, Inc. VEGGIETALES®, character names, likenesses and other indicia are trademarks of and copyrighted by Big Idea, Inc. All rights reserved. Used by permission. *Free shipping is by standard ground. Other options available.